Peter Diakonow, owner of the Waterfront Inn in Penticton in the South Okanagan, is greening his roofline with solar photovoltaic panels. 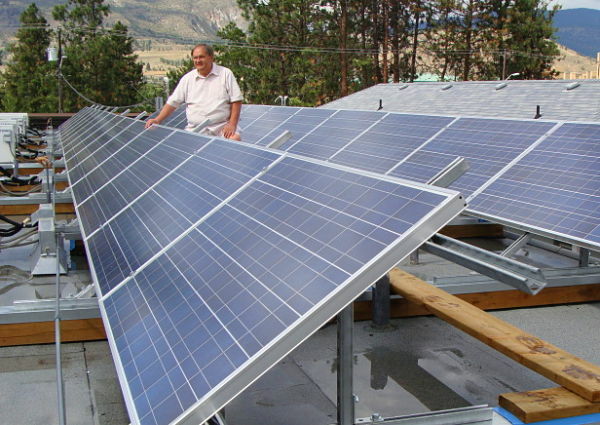 To reduce energy bills, Peter Diakonow’s Waterfront Inn on Skaha Lake in Penticton is greening its roofline with 30 solar photovoltaic (PV) modules to produce electricity and 10 solar thermal collectors for domestic hot water and pool heating. Pro Eco Energy (Swiss Solar Tech) of Summerland did the installation. “I’m very happy about the professional consulting and clean workmanship they have provided,” says Peter. Stantec Consulting, which was in charge of the structural and mechanical engineering, found a roof mounting solution that required no roof penetrations, which saved time and money. For opportunities to be in our Homes section, see Advertising.